In order to support my blogging activities, I may receive monetary compensation or other types or remuneration for my endorsement, recommendation, testimonial, and/or link to any products or services from this blog. Meet David! David is a husband and father to two young sons. His health battle begins very suddenly, but he wastes no time finding answers. His before and after pictures say so much, but I think, like me, you’ll be astonished at what happened behind those photos. My story begins January 10, 2014. Having always had perfect eyesight, I began having issues with my vision. January and February were a whirlwind journey through a multitude of doctor’s visits, MRIs, MRVs, spinal taps, specialist referrals, and seemingly endless labs. I was finally diagnosed with a blood clot in the right side of my head. More tests confirmed I was, indeed, Factor V heterozygous and had the MTHFR 677T homozygous genetic mutation. I was referred to a hematologist, who started me on the anti-platelet medication Plavix. A few weeks passed, and I appeared to be doing much better. The join pain returned with a vengeance the afternoon of March 23. I was re-admitted through the ER that evening. I remember being in such pain that I couldn’t walk from triage to the treatment area or stand to give a urine sample. Even holding a cup of water was out of the question for me. I remember being lowered off the gurney and asked to step on a scale so that they could give me the proper dose of medications. With difficulty, I managed to make it onto the scale and hated what I saw – 226.8 pounds. Self-conscious about my weight, this further added salt to my wounds. I spent three agonizing days while waiting to see a rheumatologist, as he visited the hospital only once a week. I was receiving as much Solu-Medrol and Torodol as possible. He ordered additional labs, which I thought would finally provide me with answers; I was wrong. He said he was convinced it was an autoimmune response and that I had several symptoms of Lupus (for which there was “no definitive test” – his words), but he dismissed it for me simply because I was male. He ordered more steroids and NSAIDs, and switched me from Plavix to aspirin just in case that was causing it. Driven with the prospect of a life on steroids and pain, I began researching Lupus and other autoimmune diseases. I first stumbled across Mickey’s site, just as her cookbook was launching on Amazon. I dug into other resources like The Paleo Mom and Phoenix Helix, and thought, “I have nothing to lose by trying this.” I was ready to try just about anything. I ordered Mickey’s The Autoimmune Paleo Cookbook, a book that is still dear to my heart, as it was the starting point for my journey to healing. A couple days later, I was released with more pain meds and steroids and told to set a follow up with the rheumatologist a month out. I told my wife about my research and how I was going to try the Autoimmune Protocol. She was seven months pregnant with our second child at the time, but I remember her helping me cook a lot in those early days and encouraging me along the way. It was a gradual improvement at first. At my follow up appointment with the rheumatologist, he was, at first, pleased with my progress – much lower signs of inflammation in my blood work and I had lost almost 20 pounds from when I was admitted to the hospital. When I told him about my lifestyle change, he dismissed that as the reason and wanted me to continue on oral steroids. He also set a new follow up appointment for another month away. When the second appointment came around, I had lost even more weight and was finally starting to feel like myself. My joints were barely swollen at this point, and I could actually use my fingers. My inflammatory levels were almost normal and the rheumatologist advised me to further taper the steroids. Flash forward a few months, and the weight continued to fall off. My friends started to notice and began to ask me about how “my sickness” was affecting my appetite. I had a very hard time convincing people that my transformation was a result of my healing diet and positive changes, not my illness. Over the past eight months, I read many AIP blogs and Facebook accounts of those who were living the AIP lifestyle. I searched for new recipes and others to whom I could relate. Finally, I decided I should put myself out there, to tell my story and help encourage others who were in my shoes. I am now pain free (most days), over 70 pounds lighter than when I went into the hospital, and am able to keep up with my four-year-old son – as well as anyone can keep up with a four-year-old’s limitless supply of energy. God has blessed me with a second chance at life, and I am grateful for it. I still have my flare-ups – usually if I have been under too much stress or haven’t gotten enough sleep for a few days in a row. 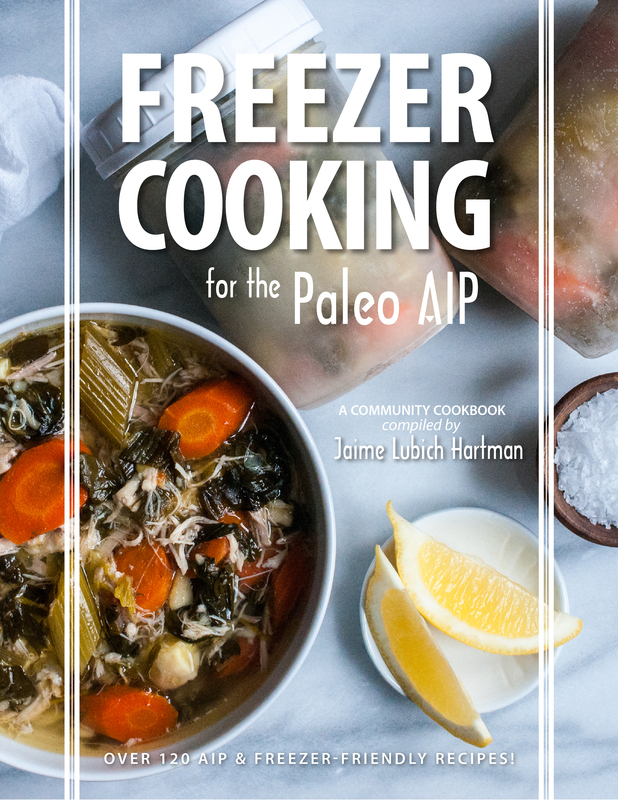 And, I have been unable to successfully reintroduce most foods (I miss coffee most of all, but can tolerate egg yolks in limited quantities on rare occasions), but my world has been opened beyond measure by the entire AIP community. It may not be a fix-all for everyone, but AIP has really changed my life. The lowest point for me was the night before the rheumatologist was to evaluate me [in the hospital]. That night, there was a two-hour period where I awoke in such pain that I could not press the call button for the nurse. I remember watching the clock on the wall across from my bed, praying (through my tears) that the CNA would be early in her rounds to check my vitals that night. She was not. When the RN finally came by, she saw how much pain I was in and asked why I didn’t call. I told her I simply couldn’t push the button. If it was possible, my tears flowed even more, because I knew I would finally be getting some relief. Morphine let me rest until I saw the rheumatologist the next morning. The fact that the rheumatologist was so dismissive of diagnosing me with something simply because I was male, was the challenge that influenced me to look for a solution. Add to that the fact he would rather have prescribed meds to me for a long period of years than be open to the idea that diet/lifestyle changes could play such an important role in healing. The rheumatologist wanted to keep me on steroids rather than look at other possible solutions. He completely dismissed the notion that diet and lifestyle changes could impact my well-being. I didn’t want to be on meds for the rest of my life, so I set out to discover what other options I had. When you found the protocol what was your first indication that it was working? I played guitar, regularly, in our church band, and was scheduled to play two weeks after I was hospitalized. I had to take some time away from that after the hospitalization because the joints of my fingers wouldn’t allow me to form chords or strum. I put all my guitars away because I was so disappointed. I remember it was sometime in the second month of doing AIP that I thought I might actually be able to play again. I was only able to play for a few minutes that day, but it was that moment that made me realize how far I’d come. Wow, there are so many to list here. First and foremost, I used Mickey’s site and cookbook. It holds a very special place in my heart, as it is what started my journey. From there, I found an almost unlimited wealth of information on blogs, Facebook pages, and books. If I had to come up with a short list: The Paleo Mom, Phoenix Helix, Alt-Ternative Autoimmune, He Won’t Know It’s Paleo, Grazed and Enthused, Beyond the Bite, The Paleo Partridge, Sweet Potatoes and Social Change . . . I could go on and on. I’m sure I’m missing some. Google is your best friend here. In addition, I’ve bought books (from many of those listed above) and borrowed several from the public library. True joy? Being able to find purple or Japanese sweet potatoes! But seriously, my family and friends mean so much to me! I went from expecting a baby, to the threat of having a blood clot move, to maybe losing my vision, to not being able to hold a cup of water – all in the course of a couple months. I remember typing a letter to my (then unborn) son, just in case I wasn’t around to see him be born. What it means just to see his smiling face! I also appreciate nature and a good night’s sleep a lot more now. What an inspirational story, you actually brought tears to my eyes when you described your lowest point. Wishing you many more months of speedy healing! Wow, I am so happy for your amazing healing journey. I too have Lupus and have just ordered the book as well, have started on a number of food elimination and already noticing a big difference! All the best to David and thank you for sharing your story. Love this inspirational story… and love David (I knew him WAY back in highschool). I have enjoyed following his journey.. Thank you so much for sharing your encouraging story, David! So great to read your story!! I love these! I’m so glad you’re feeling better, David. 🙂 such sweet relief to have a second chance and true quality of life!!! Thank you so much for sharing your story! It’s so disheartening to me that rheumatologists and doctors in general are so fast to dismiss US when WE are the ones that KNOW our bodies! You would think that WE of ALL PEOPLE would know when something wasn’t right. Bravo to you for advocating and educating yourself! I wish you continued health. David, I remember the pain you describe, where the simplest task is suddenly impossible. You show that you don’t need a diagnosis to reclaim your health. Wishing you a lifetime of joy, playing with your children and strumming that guitar! Wow, Thank you so much David for sharing your amazing story of recovery and healing through AIP, your an inspirational role model for others in the AIP community on IG. An incredible story. David is looking good these days. It’s so sad that the medical community is so dismissive of any sort of dietary interventions. I think many docs are coming around, but very very slowly. I was never diagnosed with an autoimmune disease, but I was on my way for sure. My son was diagnosed with autism, and many of us warrior parents take an AIP type approach in treating their symptoms. Personally, I lost nearly 100 pounds following a simple paleo diet. I just shared my before and after photos on my most recent blog post. It’s not a before and after post though. Rather, my goal was to show people that anyone can change their diet. I had crazy bad eating habits before I got sick enough to want to change. Hi Dave, what a transformation – thanks for sharing!